MICRO KITS 04 by Tonebuilder comes with 5 tightly crafted drum kits based on hardware classics, covering styles ranging from Chicago House to Hip Hop. The collection of analog processed drum sounds is brought to you by Tonebuilder - creator of the coveted and limited edition Driven Machine Drums sample libraries. The sample pack’s kits are formatted for a wide variety of samplers, providing instant inspiration within nearly any type of production environment. Additionally, MK04 features a custom Reaktor map and presets for Twisted Tools S-LAYER. By harnessing the power of S-LAYER’S advanced randomization and sample layering engine, the possibilities for generating new content are literally endless. MK04 comes with 30 kit and generator presets to get you started for S-LAYER. 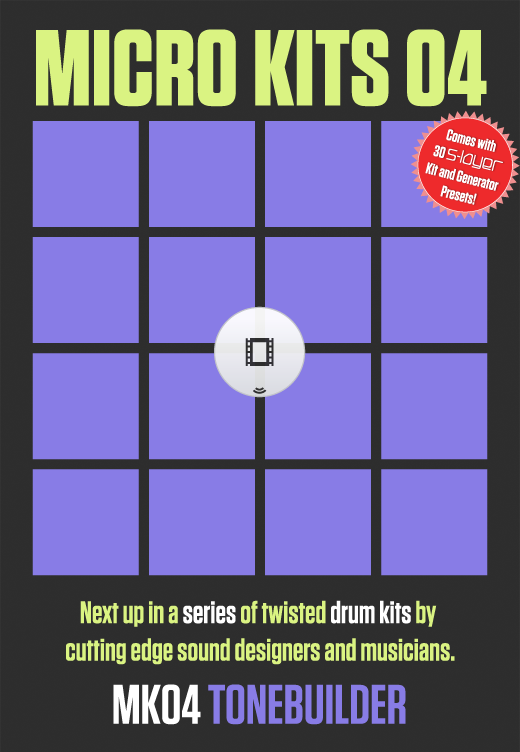 5 Drum Kits with 16 sounds each, designed by Tonebuilder. Tonebuilder is the creator of Driven Machine Drums and Driven Machine Drums STRIKES BACK!! He found himself after receiving multiple self-inflicted fork wounds in his thigh while simultaneously admiring the drum-buss compression on "Moves Like Jagger" and receiving an invitation to an "underground" event in Chicago's most posh club district. After a few hours of repeating "You are not your drum-machines" and "His name was Ron Hardy", he set out to on his own personal Operation Mayhem to covertly replace all your drum samples with exact replicas and/or sell the fat of phat producers back to themselves. All sounds captured by Black Lion Sparrow MKII A/D convertor. Mogami cables used exclusively through-out the entire process. The kits are intended to be as close to "turn-key" as possible. Just load them up, jam out. Couple of bumps, nudges, or boosts to taste, or just EQ the drum buss. At least 20mb of available disc space. Approx. 5mb of available RAM/per kit in use. The package size for this download is approx. 10MB zipped, so please allow yourself ample time to download the file if you are on a slow internet connection. On a fast connection, you should be able to download the package in about 1 minutes, while on a slower connection it may take up to 10 minutes. If you have any issues, please feel free to contact us 24/7 for help. Please consider using Firefox and the free download extension, Down Them All, if you are having problems with your downloads timing out. Get it at the Down Them All website. Made something using MK04 Tonebuilder? Leave us something using our dropbox and vist our community area where we display your work.